Get ready to explore Koh Ta Kiev! 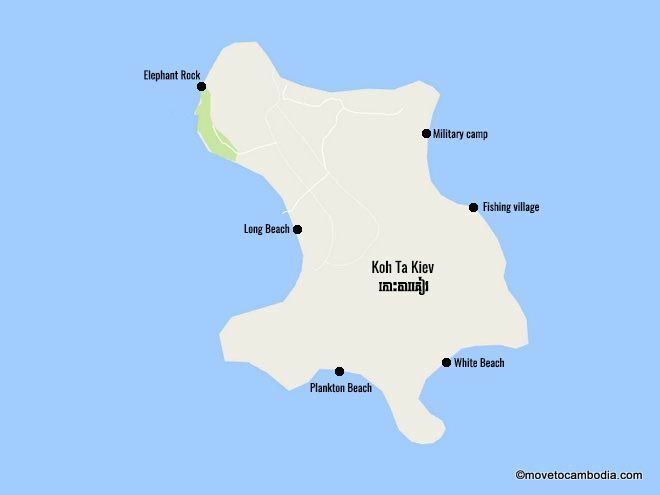 Just off the coast of Ream National Park, Koh Ta Kiev is much smaller than its better-known cousins, Koh Rong and Koh Rong Sanloem. With just a handful of guesthouses dotted along its long sandy beaches, Koh Ta Kiev is an adventurer’s dream, with plenty of amazing places just waiting to be discovered. The island’s picturesque 13.4km coastline is made up of beautiful beaches, secluded coves, rocky cliffs, and mangrove forests. Although its sandy shores are well worth exploring, the rocky outcrops and dense jungle mean that getting all the way around the island by following the coast alone is impossible. Instead, well-beaten walking trails crisscross through the island’s jungle interior.There’s nothing quite like marveling at marshlands, grassy meadows, and lush rainforest while trekking across the island. It’s by far the best way to experience the highlights of Koh Ta Kiev. Koh Ta Kiev is an nature-lover’s paradise. 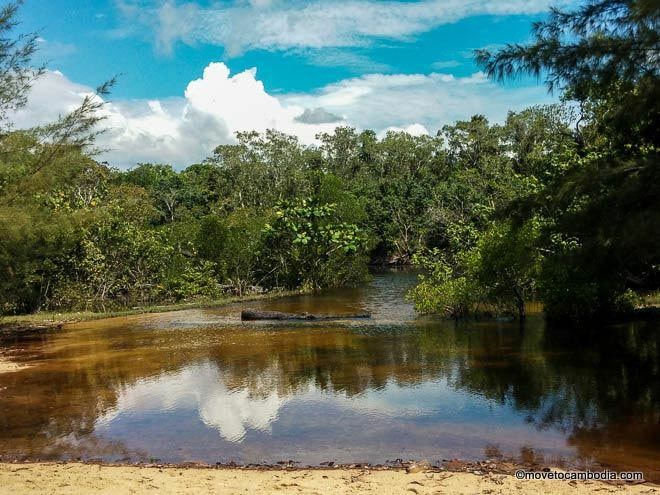 Parts of the island have been sold to wealthy developers, but so far the only sign of development is a big muddy track carved into the middle of the rainforest that is slowly being reclaimed by the jungle. Known as the “Chinese Road” and dotted with colorful trail markers and arrows pointing you in the right direction through the forest, these days the track is good for navigating your way around the island, if not much else. For now, Koh Ta Kiev remains an idyllic getaway with endless stretches of empty sand and picture-perfect viewpoints that can be found around every corner. Each of its resorts is tucked away on its own stretch of beach, with hammocks and stunning panoramas of the ocean giving the island a very spacious and relaxing feel. 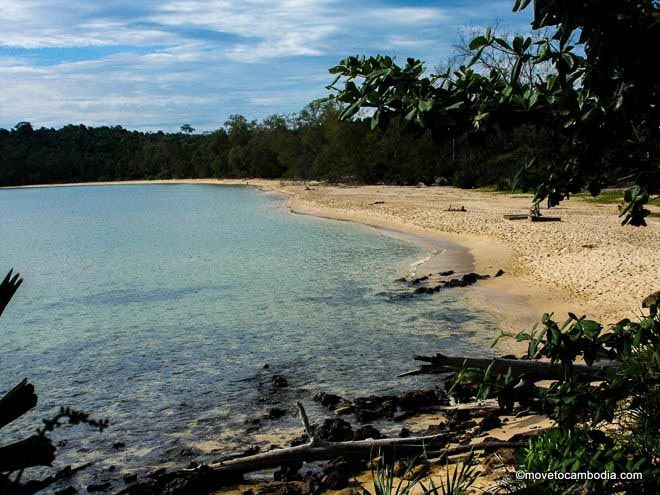 You’ll find most of Koh Ta Kiev’s accommodation along the aptly named Long Beach. 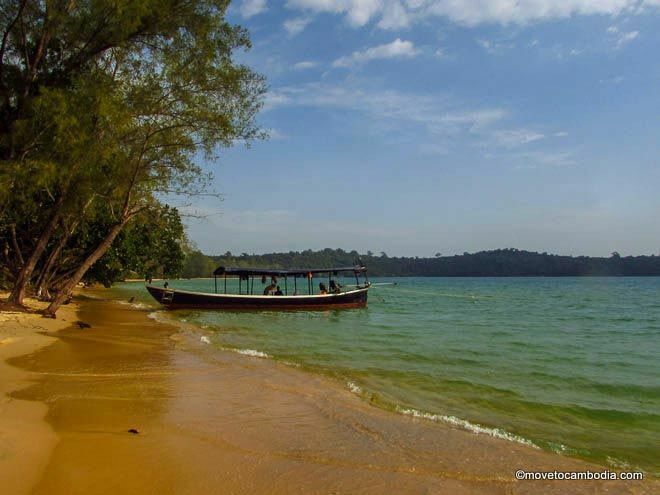 Most of the island’s accommodation can be found along the aptly named Long Beach on Koh Ta Kiev’s southwestern coast. Stretching for several kilometers along the shore, the string of quirky guesthouses offers visitors a series of unique tastes of island paradise. If you’re still not sure where you want to stay or haven’t booked anything in advance, then jump on a boat to Long Beach. You can either take one of the resorts’ private longtails or join a three-island day tour and find accommodation when you arrive. If you want to pitch your own hammock or tent, Long Beach has plenty of options, but bear in mind that camping on the military-controlled island is forbidden, so you will still have to pay a couple of dollars to pitch your tent at one of the local resorts. Find out more about transport to and from the island and the island’s resorts here. Plankton Beach offers a quiet retreat for those looking for solitude. A 30- to 45-minute walk through the jungle from Long Beach is Plankton Beach (formerly known as Naked Beach and originally Sandal Beach). Stretching between two headlands, this 2km-long beach is perfect for sunbathing, strolling, snorkeling, and late-night swims to check out the ethereal bioluminescent plankton from which the beach gets its name. Plankton Beach is the perfect spot to take in both dawn and dusk while relaxing on one of the quietest parts of the island and enjoying blissful views of beach and jungle alike. 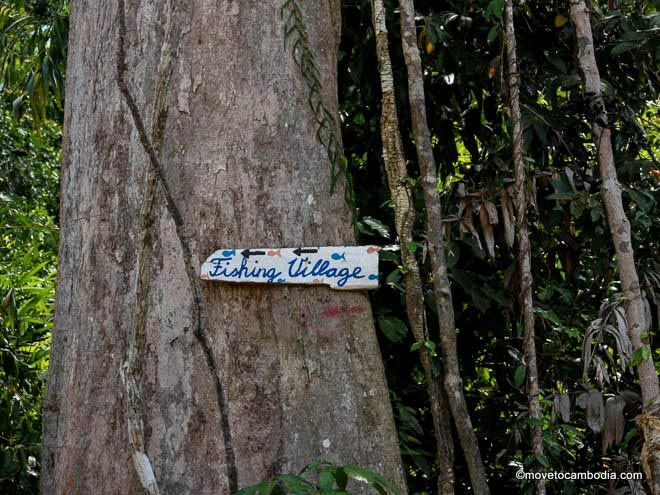 Head to the fishing village to see local island life. The island’s northeastern shore is home to the local fishing community, a ramshackle collection of wooden houses built on stilts leading out to the ocean. 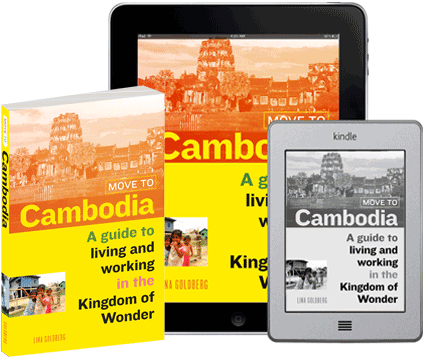 With boats ferrying people to and from Ream, and fishing boats coming in daily with freshly caught fish and crab, it’s a great place to enjoy a taste of authentic Cambodia. Unfortunately, at the time of writing there was no accommodation available there, but for keen photographers and anyone interested in the culture and history of this fascinating island, this tiny village is well worth the trek. Elephant Rock is an 8-meter high rocky outcrop overlooking the ocean. The perfect spot for a bit of adventurous cliff-jumping and great views of the island, it has quickly become one of the island’s most unmissable attractions. Follow the elephant signs through the jungle past Crusoe and find your way to the beautiful look-out spot and jumping point. Find out more on our Koh Ta Kiev activities page. The island’s rocky northeastern side is also home to the highest point on the island, as well as some amazing hidden beaches, coves, and even hidden caves full of bats! 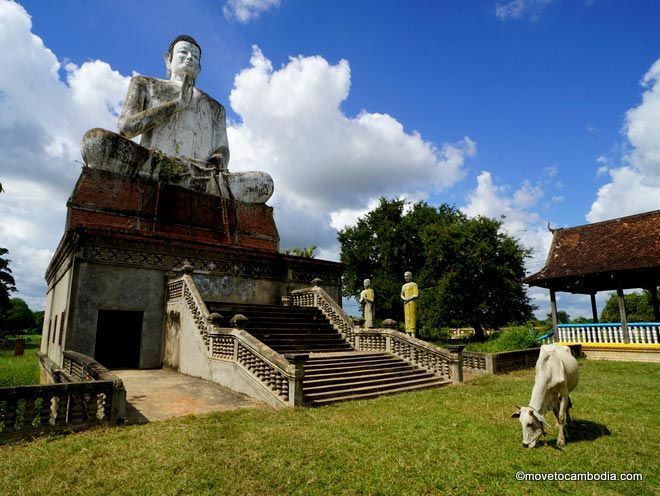 (All the more reason to have your rabies vaccination before coming to Cambodia). On the southeastern side of the island is a beautiful and expansive beach, known as White Beach. Although it is an excellent spot the enjoy the sunrise, most of the beach has been washed away, making it not worth the trek. Koh Ta Kiev has an abundance of natural beauty to explore. Moving further west, the northern shores of Koh Ta Kiev are home to a mango farm; the island’s first luxury resort, Diamond, which is yet to open; the military base; and a fish farm. This is one of the points farthest away from the island’s main accommodation options, and generally it’s not worth wandering this far to check out an empty resort or some fermenting fish. But if you do find yourself on the northern shore, these features are well worth checking out. You can also get a good glimpse of the mainland and the gray ships of Ream’s Navy Base from here. 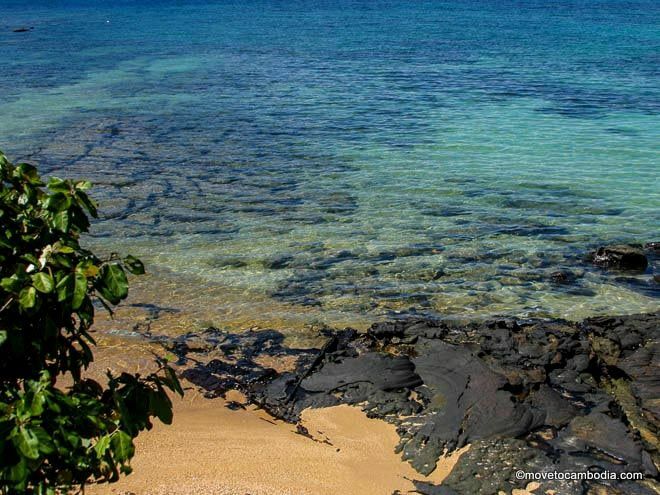 Tucked away between the island’s two main beaches, Long Beach and Plankton Beach, is a third beautiful, remote, and rocky beach known, inevitably, as Rocky Beach. Reach it by taking an approximately 30-minute trek through the jungle from Long Beach, following the black trail. It’s perfect for an afternoon of lazing around or taking in a picture-perfect sunset in blissful seclusion.